The Complete Series includes all 40 episodes of the iconic series in a 5-DVD set. On DVD August 11, 2015! 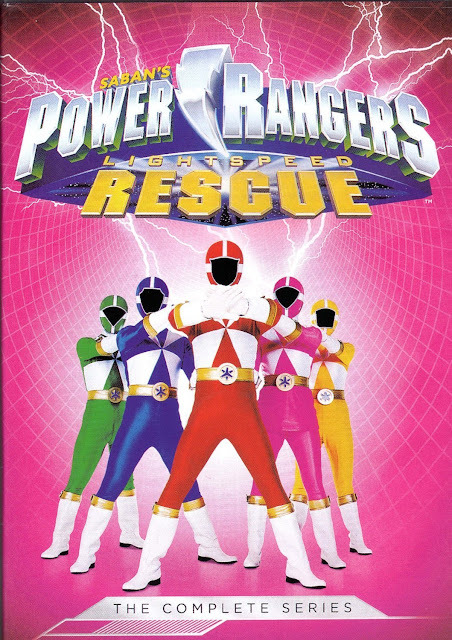 Power Ranger debut in 1993 had my oldest son hooked from the very beginning and as the year went on my other children joined him in watching this series whenever it was on tv. Power Rangers has become an iconic live-action pop culture series over the years. I love the message that Power Rangers conveys of helping others by using team work. It is hard to believe that my own adventure with Power Rangers began over 20 years ago and that it is still going strong today. After five thousand years of incarceration, the evil Diabolico and his treacherous army of demons have escaped their imprisonment and will stop at nothing to destroy the community of Mariner Bay and its innocent citizens. The new Power Rangers, empowered with top-secret technology, are the planet's only hope. Chosen for their expert skills, this unique team of five - a firefighter, an aquatics professional and a martial master, an accomplished aviator, an extreme sports enthusiast and a paramedic - is commissioned to defend Earth from the evil Diabolico and wage their battle from the safety of their high-tech underwater compound and weapons laboratory, the Lightspeed Aquabase. The stakes are high as these brave Lightspeed rescuers form Earth's final line of defense.